► Krystal Kote™ CalTrans Formula (CTF) Gloss, clear is a two-component, high-solids, low VOC, cross-linked, aliphatic polyurethane coating possessing outstanding resistance to harsh environmental conditions; graffiti; mold’ mildew & microbe growth; caustic chemicals; abrasion; impact; and flexing. ► KrystalKote™ CTF is resistant to the effects of U-V and I-R: clear will not yellow, clear-coated underlying colors and custom-tinted KrystalKote will not noticeably fade for 10-years . ► Krystal Kote™ CTF has proven flexibility and tolerance to expansion & contraction, providing a crack-resistant surface, desirable in harsh environments such as salt-air coastal, high heat desert, frigid mountainous, and high humidity of the Northwest & the Southeast. ► Krystal Kote™ CTF is completely resistant to hydraulic, lubricating and cutting oils, alcohols, food stains, normal acids & alkalies, salts, solvents, fuels, paints, inks, asphalt, wet concrete, algae, mildew, fungal molds, pesticides, fertilizers, creosote, etc., and temperatures to 450ºF. 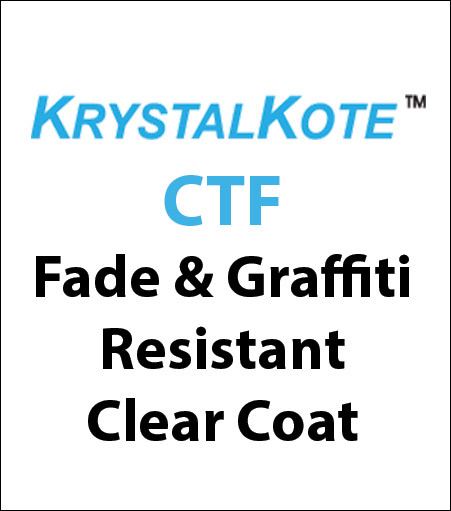 ► Krystal Kote™ CTF is CalTrans-Approved and specified as a Graffiti-Resistant clearcoat for traffic signs & soundwalls.